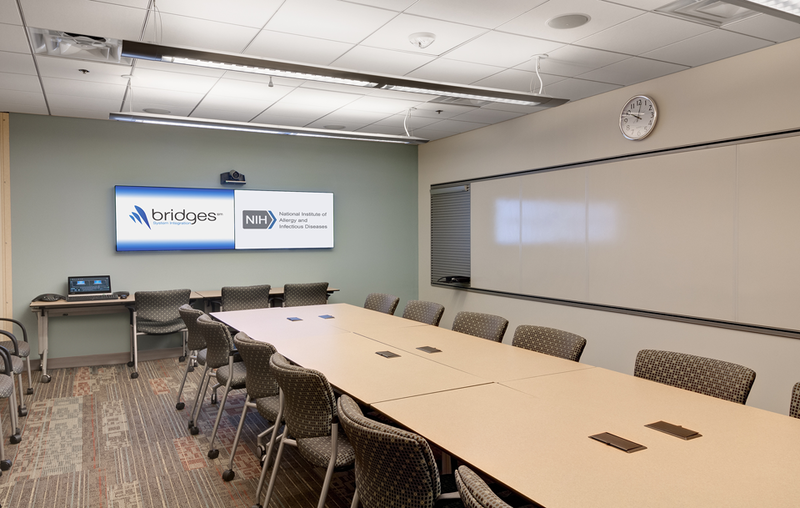 Bridges SI designed and integrated a comprehensive AV system for multiple spaces within a NIH NIAID conference center. 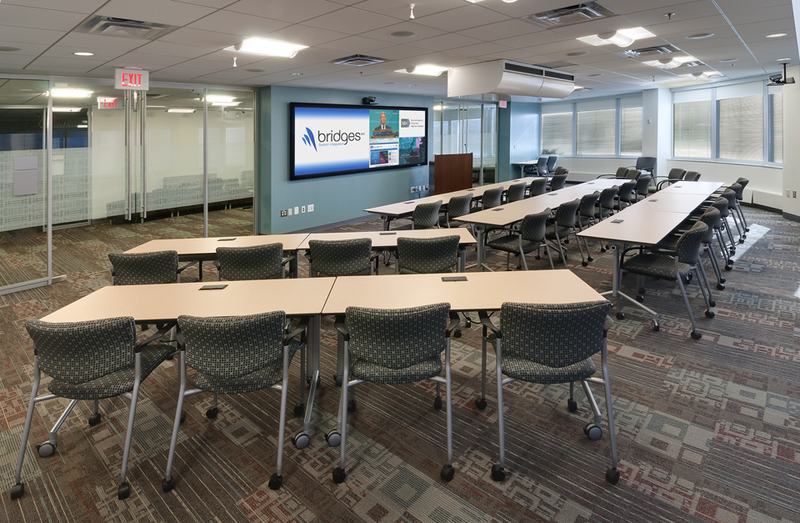 The scope of the project encompassed a large conference room, two divisible conference rooms, various breakout collaboration areas, and a centralized equipment room. All spaces are interoperable via a shared digital media switching and distribution core. The large conference room presented spatial challenges that required an outside-the-box mentality and approach. The edge-blended projection system provided optimal viewing and video scaling capabilities, but the heat and noise output within the space were undesirable and detracted from the experience. With the ceiling a mere 8’6”, there was not much space to work with in consideration of participants seated throughout the space. 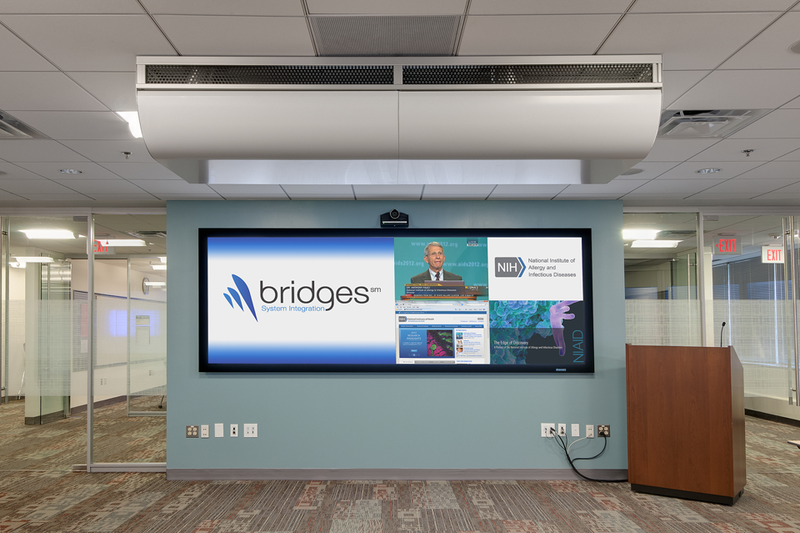 Bridges SI collaborated with the facility interiors team to fabricate a custom trough that dissipated the heat through plenum within the ceiling opposed to the open air within the working environment. 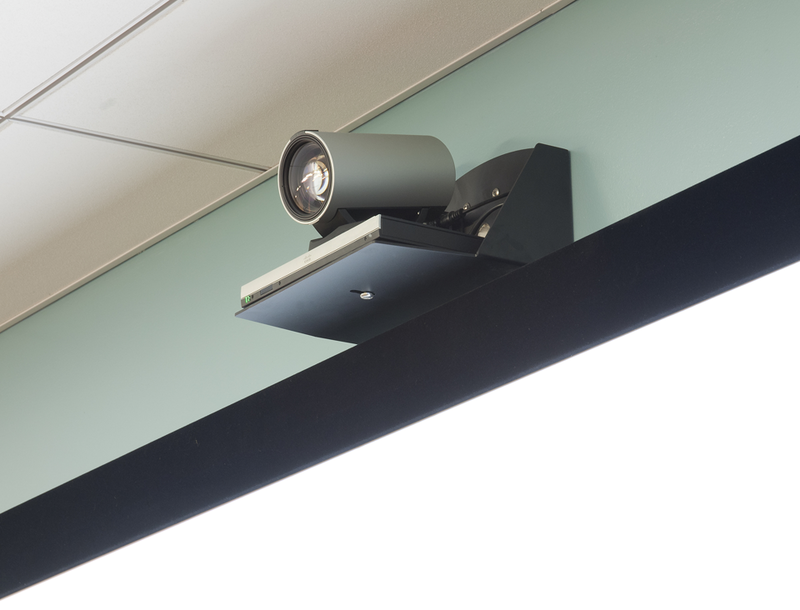 The result is an aesthetically- and acoustically-sound ceiling mount that provides integrated ventilation and sufficient support for the dual edge-blended projectors. The system is based around a central digital-media switching and distribution system. 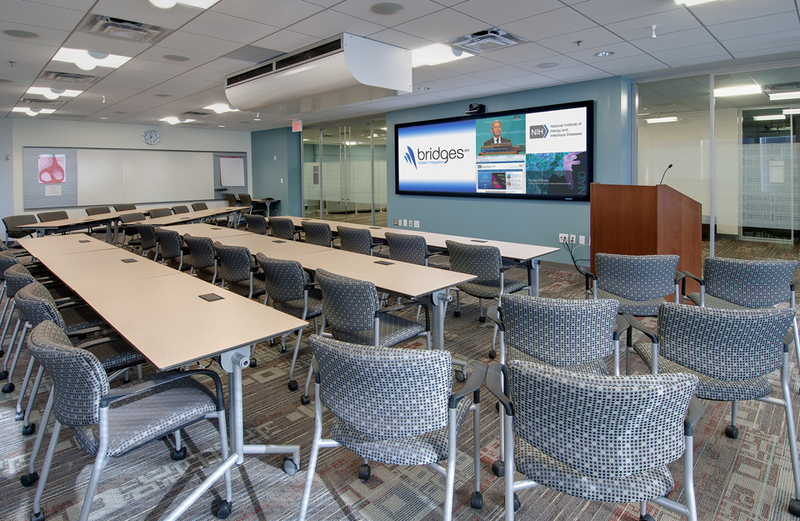 Multiple video sources are available for routing throughout the connected spaces, including local PCs and laptop connections, cable TV, and an integrated HD Video Teleconference (VTC) system. 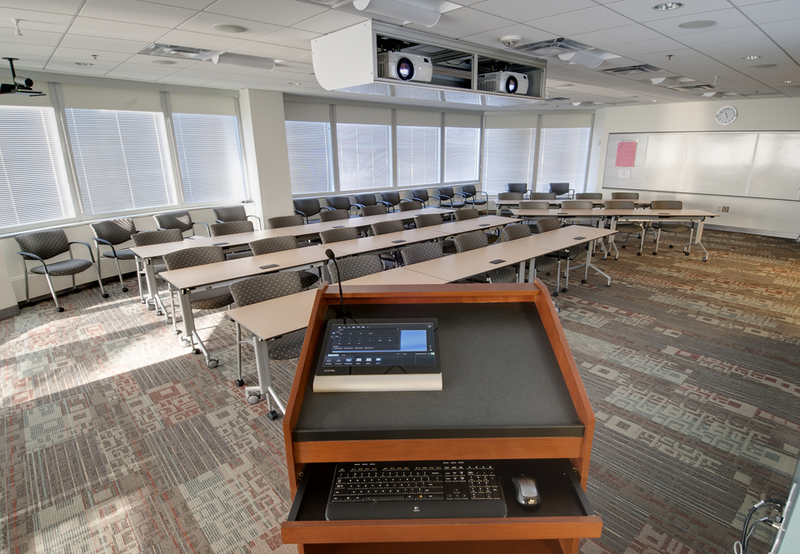 There is an executive lectern installed within the primary space that is equipped with an integrated touch panel control system. The touch panel includes HD video preview capabilities, allowing presenters to view and manipulate sources prior to and during presentations. The video processor and control systems support pinch and zoom capabilities, allowing various sources to be adjusted and displayed at different sizes for optimal performance and collaboration. 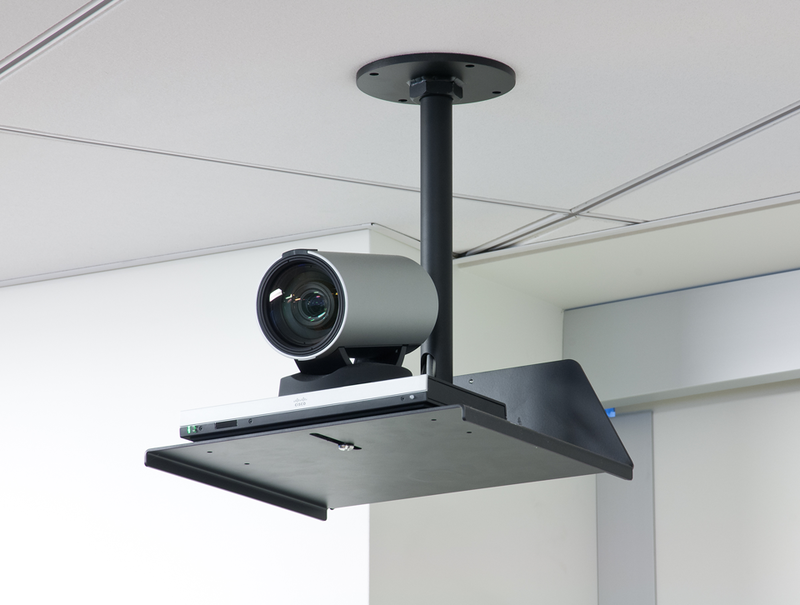 The two divisible spaces are outfitted with a shared AV system that supports the ability to operate independently as two spaces or combined as one cohesive functional room. The two divisible spaces are identical in equipment and functionality, and are separated by a manual partition wall that is tied into the control system. Depending on the room configuration, the control systems are programmed to automatically adjust for appropriate control settings. There is a separate “think tank” space with a wall mounted interactive flat panel display system installed. The interactive flat panel display supports annotation and capture capabilities via a connected dedicated PC equipped with interactive software. Users can openly collaborate and annotate over computer content, which can be saved for future playback or distribution throughout the system. 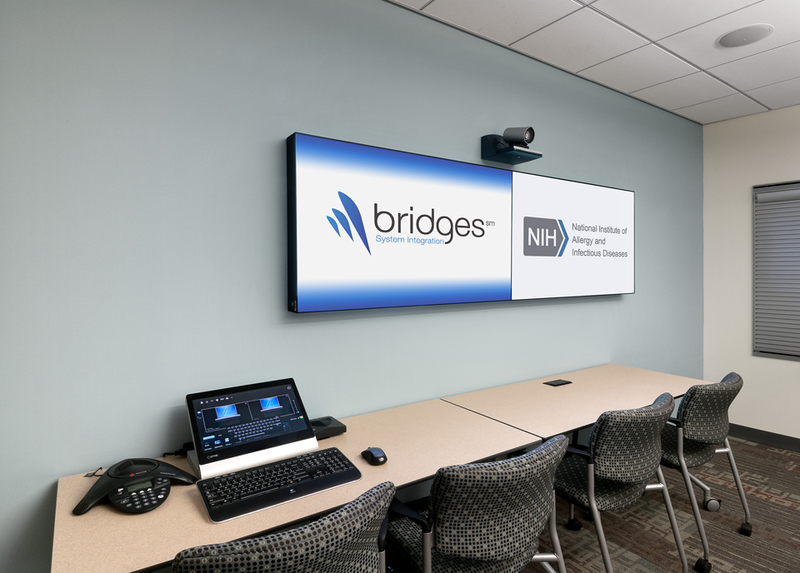 Bridges SI worked with NIH and their onsite IT department to ensure all PCs and network-related components were interfacing in compliance with the installed AV systems. All of the AV system components and functionality are covered under a full service agreement to ensure continued operational efficiency for NIAID.